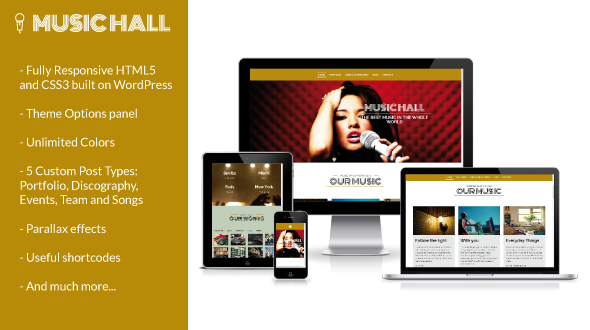 Music Hall is a sophisticated and complete WordPress Theme for musicians and music bands. Simple to use, this theme is built with semantic HTML5/CSS3 and is completely responsive (using mobile first!). Music Hall includes lots of advanced features like discography and songs management, parallax effects, SEO Optimized, Custom Post types, porfolio section… It’s designed to be customisable to exact requirements. It has all the features what you need for a music band theme. This music template has built-in HTML5 audio player that plays self-hosted mp3 files. You can use featured tracks player on the homepage, and if you want, you can add iTunes, Amanzon and direct links to purchase the album. Whether you are a profesional or not, this WordPress theme includes all features you need for your music band or label, to present, promote and sell your work and songs online. Of course, this template can be used for any other purpose. It is fully cusomizable and fits to any device (it´s fully responsive! ), from very wide desktop screens to small smartphones. Music Hall also allows you to have how many photo albums you want. Once you create the desired album-portfolio, in there you can post any amount of photos you desire. Furthermore, team section is the perfect site where you can add data and personal information about your singer, guitarist and drummer…Get in touch with your fans! Flickr CC Commercial Use Images from: Kopaz (http://www.flickr.com/photos/kopaz/), Jon Ashcroft (http://www.flickr.com/photos/theilluminated/), Rudolf Getel (http://www.flickr.com/photos/rudolfgetel/), Austin Kirk (http://www.flickr.com/photos/aukirk/), Leah Tautkute (http://www.flickr.com/photos/leah-tautkute/), mark sebastian (http://www.flickr.com/photos/markjsebastian/), Used for the demo site. Not included in the template. v1.2 – 24 Mar 2014 – Update version. v1.1 – 25 Feb 2014 – Update version.